Players who love the Fender clean tone but want an extra smooth punch and a modern versatile overdrive tone should plug into the Dual 6L6. 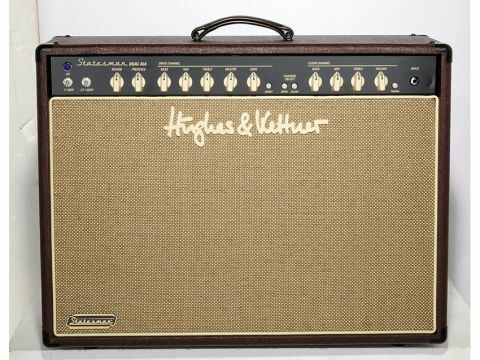 Overall build quality; wide range of tones; great clean sound and overdrive dynamics. Huge gain gap between the two channels; dead reverb niggles. It's a partly closed-back combo, running on 6L6 power valves synonymous with what we'd think of as the classic American sound. It is loaded with two 12-inch special-design Eminence Rockdriver Cream speakers, which according to the company were specifically designed to bridge the gap between an American and British speaker voicing - for example, a sonic cross between the Celestion Vintage 30 and the lower powered Greenback. Aesthetically, it shares the same retro-classic styling of the other Statesmen; the Tolex is well finished and nicely tucked in around the sharp corners of the cab. It's also relatively light so lifting the 2 x 12 back into the car boot isn't too much of a worry after a long set. Accessing the valves in the Statesman is a straightforward task, but no more so than with any other classic amp design. Take the two screws out of either side of the valve cover and it's off. The clever thing is the bias point - this is where you set the idle current to your power valves - which is just below the valves, set in on the back of the chassis rather than inside it. The Dual 6L6 is not one for bedroom blazers. This combo is loud, and needs to be played loud to get the best from it. It's a must-audition alongside Fender's Hot Rod and Super Sonic amps, especially if you like the Fender clean shimmers but aren't so sold on the overdrives. You can go from Blackface to Black Crowes to (almost) Black Sabbath easily and quickly - no mean feat.